Most weeks I enjoy the challenge of trying to match my Friday movie pick somehow with what I have written about during the week. Sometimes it doesn’t work, but it’s a puzzle I always try to solve. Considering the art exhibition I covered on Tuesday and the classic house I featured yesterday, I think today’s movie, also a vintage classic, fits in rather nicely. Like last week, I would imagine many, if not most of you, have seen this quintessential film but it’s one I could, and have, watched on numerous occasions without tiring of it! 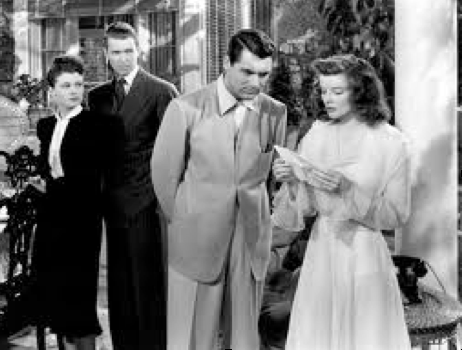 Philadelphia Story, is Katharine Hepburn’s 1940 reprisal of her hit Broadway role, which actually has an interesting back story. 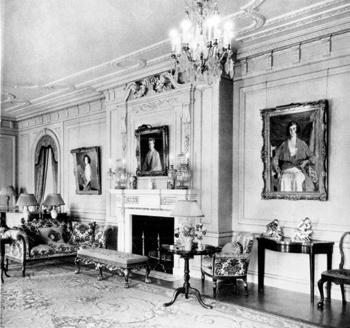 Playwright Philip Barry first conceived of the idea in 1938 as the story of a wealthy family being studied for an article in Fortune. As a member of the cocktail-circuit Ivy League elite, he knew this world well. 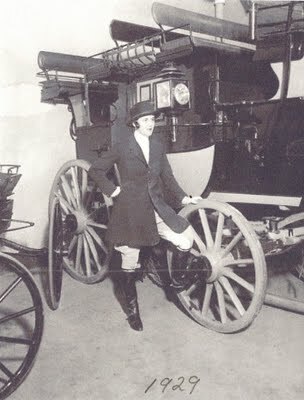 It was his wife who suggested the setting of Main Line Philadelphia, where he chose socialite Hope Montgomery Scott as the model for his heroine Tracy Lord. 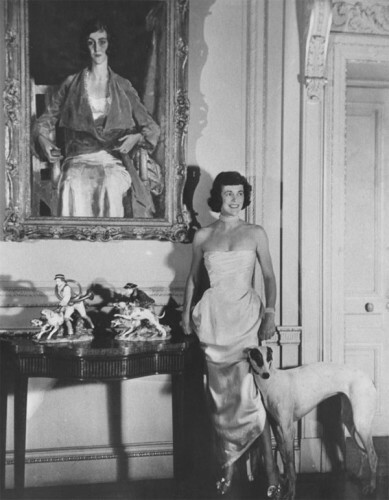 Dubbed by Vanity Fair as “the unofficial queen of Philadelphia’s WASP oligarchy,” she was an avid foxhunter and later became director of the U.S. Equestrian Team. 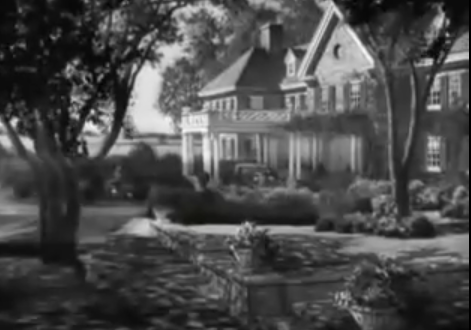 The family home, Ardrossan, in Wayne, above, became the model for the Lord’s beautiful Philadelphia house in the film. The classic chintz filled interiors capture perfectly the gentility of proper Mainline lifestyle. Howard Hughes, who had financed half of the costs of the play, purchased the film rights for Hepburn (they had had an affair several years earlier). MGM was chosen as the studio to make the film because they would give Hepburn approval of her leading men and director. She of course chose George Cukor to direct and her first picks for co-stars were Spencer Tracy (naturally) and Clark Gable – but because neither was available, settled on Cary Grant (who I’d settle for any day of the week) and Jimmy Stewart. Cary Grant, by the way, ending up giving his entire fee of $ 150,000 to the British war effort. 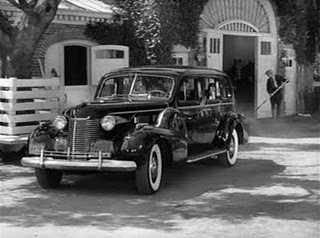 Needless to say, the film was a huge success, garnering 5 Oscar nominations, with wins by Jimmy Stewart for best actor and Donald Ogden Stewart for best screenplay. There’s so much to love about this film. The incredible ensemble cast is stellar. 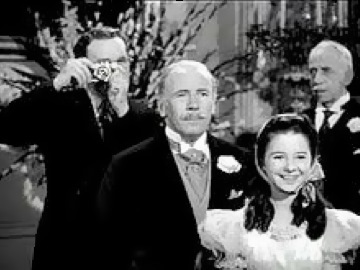 Not only are Hepburn, Grant and Stewart fabulous, but so is Ruth Hussey as the beat photographer, Roland Young as the incorrigible Uncle Willie, Mary Nash as Hepburn’s quietly suffering mother, John Howard as Hepburn’s climby fiance and the marvelous Virginia Weidler as Dinah, Hepburn’s precocious little sister. The house is fabulous ( check out the millwork details as well as the Lutyens styled bench) as is the understated decor and all the set accoutrements. The costumes by Adrian are the peak of chic. Not only is Hepburn’s dress divine, but take note of Grant’s stylish collarless jacket. I love the gingham trim at the end of the slightly bell sleeve. 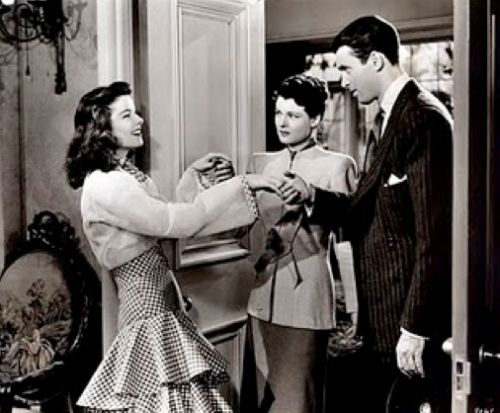 If you are looking for some stylish, witty entertainment this weekend, you need look no further, Philadelphia Story has it all!! And if by some chance you are seeing this for the first time, I’m envious – you’re in for a treat!! Take a peek at the vintage trailer. This entry posted in entertainment, film. 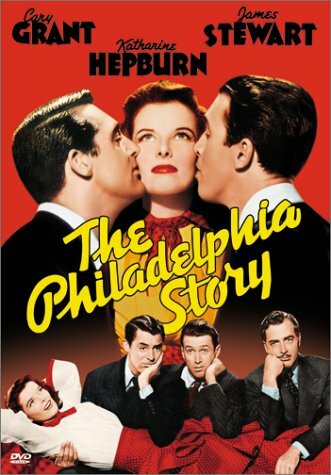 Entry Tags: Cary Grant, Classic Films, Hope Montgomery Scott, Jimmy Stewart, Katharine Hepburn, Philadelphia Story, Philip Barry Bookmark the permalink. What fantastic images of Kate Hepburn! I’ll have to add this to my list. Thanks for adding Splendid Market to your blogroll!! One of my very favourite films…..I must watch it again after reading your post and seeing these images….Happy weekend, xv. If this movie doesn’t charm you, then I don’t know what will! Sigh. It really does have everything and my very favorite stars (save for the other Hepburn) to boot. Have a wonderful weekend, Q! This is one of my favorites and I love this series on Friday since it reminds me to add all these great classic to my Netflix queue! Thanks, Q, and happy weekend! I haven’t seen that movie in so long, I can’t wait to watch it again. I know I will pay closer attention to the house and costumes. On the agenda now for Saturday or Sunday! There’s a new book out on Cary Grant, “Good Stuff,” by his daughter, Jennifer. He apparently retired from movies when she was born, and then immersed himself in fatherhood. One of my all time favorites! I think I’ll have to watch it again… and again. And totally agree — I’d settle for Cary Grant any day. I can’t imagine this film without his brilliant and inimitable comedic timing. Great pick! Happy Weekend!! 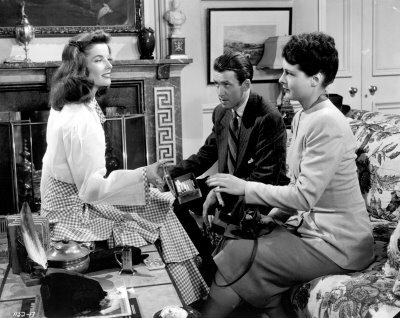 Cary Grant, Jimmy Stewart & Katherine Hepburn – doesn’t get any better! 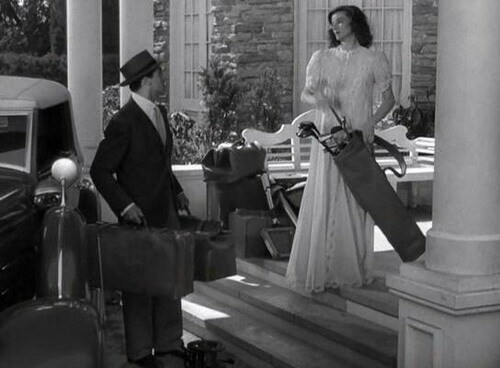 Always love watching for monograms in these old movies. A designer in NY catalogues monograms in the movies and I try to keep an eye out for ones to add to his collection. Have a great weekend Q! Love, love, love! One of my favorites, with my most favorite actors/actress. Thanks for reminding me. I will have to try to find it and buy it. Have a great day, q. One of my all time favorites! 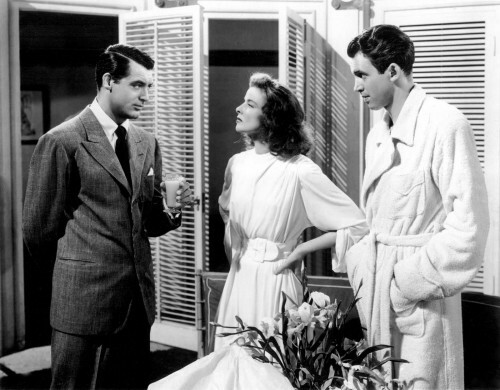 It doesn’t get any better than Jimmy Stewart, Cary and Grant and the divine Ms. Hepburn!!! will have to check it out..it’s a film I’ve not actually seen.. This looks like a goodie!! Love the story line and it looks so glamorous and anything with Katherine Hepburn is a winner in my book, Will have to see if I can get it from Netflix…..have a wonderful weekend! Magnificent choice Q.! I adore this film and I didn’t have a clue about the back story, so thanks for filling us in. I didn’t even mind the remake with Grace Kelly, Frank Sinatra and Celeste Holm…having a brain freeze on who played Dexter—maybe because CG was so irreplaceably divine! Great one. 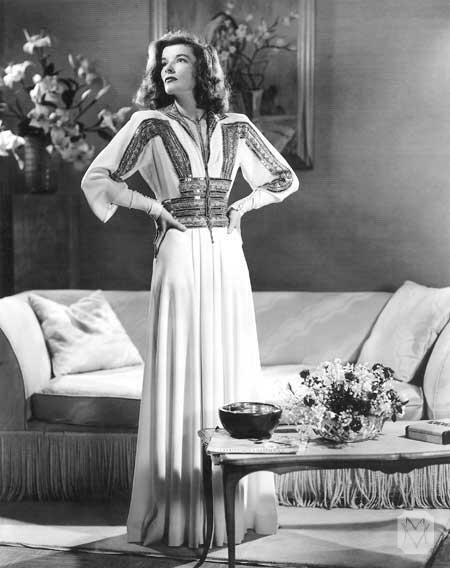 Katharine Hepburn is always a favorite. I agree. Her outfits are fabulous! 83 queries in 0.648 seconds.